Record­ing game­play footage cre­ates the most use­ful infor­ma­tion for me, while keep­ing the work­load for you low, aside from actu­al­ly test­ing the game. It can be a bit tricky to set up, so here’s how it works. Please do a test run of your record­ing pro­gram to make sure it works and is set up cor­rect­ly! Thanks! You can only use this on Win­dows 10, but you won’t have to install extra soft­ware if it works. Step 1: Press [Win­dows] + [G] to open the game bar. Tick ‘this is a game’ if nec­es­sary. Step 2: Tick ‘Record micro­phone’ in case you want to do so. Press the red cir­cle to start the record­ing. Once the timer appears, the record­ing has start­ed. Record­ings will last an hour with the default set­tings, select the cog­wheel if you want to change this. Step 3: Open the game bar and press the red cir­cle again to stop the record­ing. You will get a noti­fi­ca­tion that leads to the Xbox app, but it will also be saved in your Video library, in a fold­er called ‘Record­ings’. This method is sad­ly prone to poor­ly-explained error mes­sages, so if this doesn’t work, you’ll need to install anoth­er tool to help record footage. 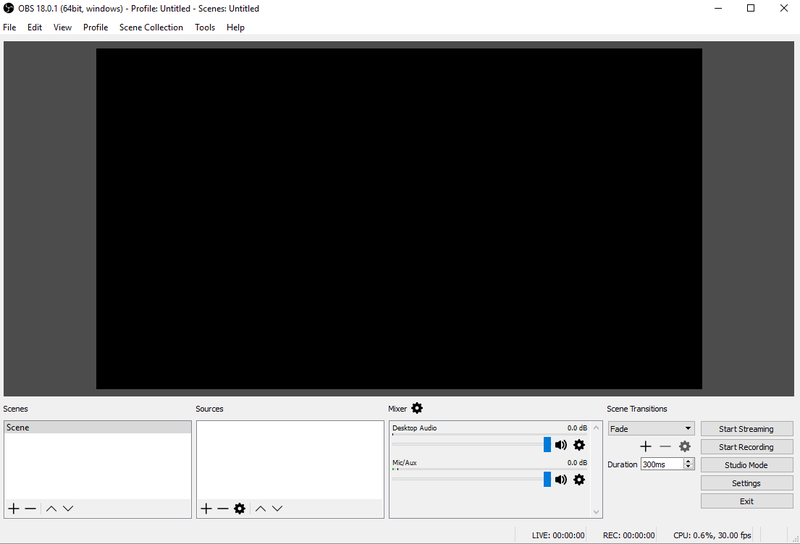 OBS is a well-known used tool to record and even stream game footage! It’s a bit more com­pli­cat­ed to set up but it works like a charm. Step 1: Down­load OBS. Go to this page, scroll down to down­loads, and pick the ‘OBS-Studio-18.0.1-Small-Installer.exe’ ver­sion for Win­dows. Step 3: Click the + under ‘Sources’, and add either a ‘Dis­play Cap­ture’, which records your entire screen, or ‘Win­dow Cap­ture’, which only records a spe­cif­ic appli­ca­tion or game. Step 5: Make sure your audio and micro­phone are work­ing cor­rect­ly and tog­gled on as desired. If the top green line moves when your com­put­er makes sound, and the bot­tom one when you make sound, it’s set up cor­rect­ly. Step 6: Click on ‘Start Record­ing’ (NOT ‘Start Stream­ing’) to, well, start record­ing! A timer on the bot­tom will start run­ning, that’s your con­fir­ma­tion it’s run­ning. Once you’re done, select the same but­ton (now say­ing ‘Stop record­ing’) to save the file. Your footage will be saved in your video library! If it doesn’t, check the set­tings to see where it has saved them: Set­tings > Out­put > Record­ing > Record­ing Path. It’s real­is­tic for half an hour of record­ed footage to be 500 MB or larg­er. This is okay, but if you have a sub­par inter­net con­nec­tion it could take ages to upload. Set­tings > Video > FPS, change this to 20 or maybe even 10. I rec­om­mend you set it to 15 FPS: you can do that If you set it to accept inte­ger FPS val­ues with the left drop-down box. Set­tings > Out­put > Record­ing > Record­ing For­mat. Set this to MP4 for the small­est file size. Please note that if you do this, though, should your com­put­er crash dur­ing the record­ing progress, the video will be lost. mov and mkv are also good alter­na­tives. If you change any of these set­tings, make sure to make a test record­ing to make sure it still works after your changes. You’ve recorded footage! Now how do you get it to me? Is your video file under 25 MB? Great– then you can just mail it to me and you’ll be done! Many mail pro­grams won’t let you send files of 25mb or larg­er. In that case, look into one of the fol­low­ing alter­na­tives. Use WeTrans­fer to throw across files of up to 2GB! You can either mail it to me direct­ly, or gen­er­ate a link that you can send me some oth­er way. Very con­ve­nient for video files! If you use Youtube, you can use it to upload the footage. Make the footage ‘unlist­ed’, so only those with the link are able to access it. Then, mail it to me when it’s done! If you use Dri­ve (or Drop­box, or OneDrive, or etc. ), upload the footage there and set shar­ing to ‘vis­i­ble for every­one with the link’. Then send the link! Make sure you delete it lat­er to recov­er stor­age space. Make the file small­er by com­press­ing it, so the video becomes small enough to be sent using one of the ear­li­er explained meth­ods. Explain­ing how to do this is out of scope for this arti­cle, so if you want to do this send me a mes­sage and I’ll help you out. Thanks, and good luck with testing!